We will have a Christmas Morning service from 10.30-11.30. It’s a relaxed time for everyone as we celebrate together. There will be no service on Sunday 27th December. Sunday 3rd January will be an ‘ordinary’ Sunday – so there will be just one service, not our regular two services as we do on the first Sunday of the month, and Junior Church will be on. It’s back by demand; Kings, Shepherds, Mary, Joseph, real animals, and much more. We would love for as many people to get involved as possible, thank you to those who have already offered. There will be a signup sheet circulating over the next couple of Sundays – please sign up if you can. This year we will be distributing postcards advertising both Christmas Alive, and other things going on in the church. If you are able, please sign up for delivering the card, along with a chocolate Christmas bauble. And if you can’t make it for our live event, then we’ll also be running our online interactive Christmas Alive website again, throughout December. 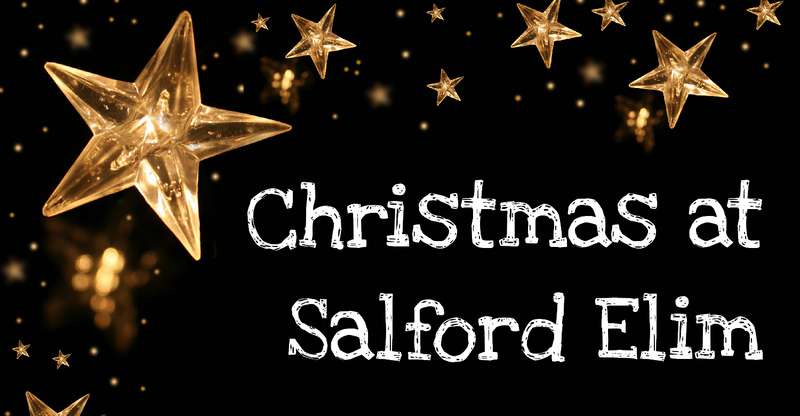 Visit salfordelimchurch.org/christmasalive, and you’ll be able to journey through the Christmas story, hearing from each of the characters as you go, leave questions for them, and get replies back! We are thankful that the cafe has been open for over 4 years and has embedded its self within our community. One of the things that is a struggle for us is keeping on top of the deep cleaning, which is required once a month. When the cafe is open, it is difficult to start some of the jobs because a customer will walk in, and the job has to be left. Please would you consider joining a team who would help us with this important job? Please see Mary or Sam if you can help.